Claudio Borchia, geboren 1979 in Vercelli (in der Nähe von Venedig) war bereits selbst schon Gast bzw. Künstler in der ALTEN SCHULE. Claudio Beorchia (Vercelli, 1979 – lives near Venice) is an Italian visual artist. He studied Design and Visual Arts at IUAV University of Venice and at the Academy of Fine Arts in Milan. 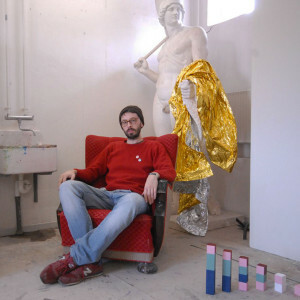 He obtained a Ph.D. in Design Sciences at the Doctoral School of IUAV University. His artworks have been displayed in numerous exhibitions in Italy and abroad (Argentina, Armenia, China, Croatia, France, Morocco, Russia, Slovakia, Uruguay). He has been artist in residence in Italy (Turin, Sardinia, Molise, Sicily), China and Denmark. Aktuell kein „Schul-Betrieb“ – die Alte Schule Künstlerresidenz macht Pause! CAMPBASEL revisited 2017 – 12. – 25. Juni 2017 – Wir sind dabei!